A transfer case is unique to 4 wheel drive vehicles, and is what directs power to both ends (axles) of the vehicle through two separate driveshaft's. 2 wheel drives don't need a transfer case as the driveshaft comes directly out of the transmission to the drive wheels. The transfer case is attached to the rear of the transmission and gets its input directly from the transmission. Power is directed from the engine through the transmission and then through the transfer case to either the rear wheels or both the front and rear wheels. 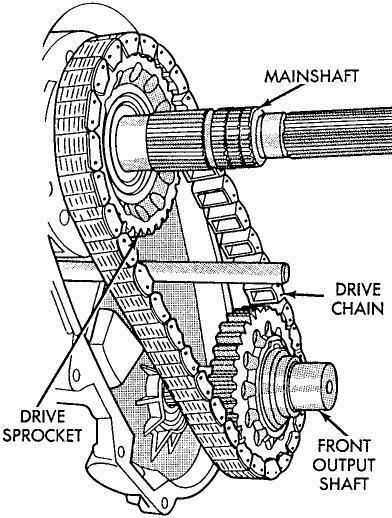 This is accomplished inside the transfer case by either chains or gears depending on the type of transfer case. In any case, a 4-wheel drive vehicle will have a selection of two gear ranges. This is called High range and Low range. This is one of the characteristics that distinguish "4-wheel drive" from "All-Wheel Drive".